Maisy’s is what Downtown Baltimore or what a downtown in general feels like. I prefer the latter, because it reminds me of a part of any city, that truly feels like a city. Baltimore has a lot of neighborhoods within it, yet it does have parts that seem like there’s lots of action. This particular part of Charles Street, which bridges downtown to Mt. Vernon, is an area I used to frequent all the time. While it gets busier things also seem to be a bit slower. Time has stood still, and so does the traffic, so does everybody. Good friends of mine were regulars of Maisy’s when it first opened maybe 5-6 years ago, but for various reasons, life happens, and life goes on. That didn’t mean to sound so dramatic. But my friends did sell me on the place without having to sell it. It’s a hidden gem, hiding in plain sight. Near several other restaurants, bars, and other establishments it might be easy to overlook and take for granted. I could see that. The first time I ate here was literally five years ago. And that might have been my only time. This was before any blogs or pizza storytelling were on my radar. Well it was slightly on my radar or we wouldn’t be here now. I just recall the pizza being pleasantly awesome. I had been tipped off (sounds so exciting) on the fact that their pizza is one of the more underrated in the city. That’s a relative term. What’s rated one way to you, is well, yeah..
Having no recollection of what exactly I had, I can say that the pizza and atmosphere was tremendous. Maybe it’s having no expectations, going somewhere alone, and going somewhere for the first time. I also recall that I was in between social engagements that day, so that time alone is always welcome. Don’t take that for granted. We all know how time alone is fewer and far between than it used to be. If we let it. That was a moment in time. Nothing noteworthy, newsworthy, or life changing. Sometimes those are the best. The way the place was lit did leave a lasting impression, and there’s a quaintness, despite the large space, that is perfect for this or any neighborhood. It works in a downtown setting. Moving along a few years later, you can’t replicate the first time. I was with a friend, and was craving pizza. Surprise surprise. But this time something felt off. By no means was I trying to relive something that doesn’t exist. The restaurant looked exactly the same, which I like. Well maybe it was different. I don’t know. It’s been a while. We shared the Buffalo Chicken and The Mediterranean. There isn’t much home to write about. It was fine. It was food. It was there. You’ll notice the charring on the crusts of both pies. They went a little overboard. I love brick oven pizza. I love any way a pizza is cooked, as long as the end result is that it tastes good. Sometimes you want it greasy, crunch, and with little thoughts to the craftsmanship behind it. There’s some effort put into these pizzas, but something was missing. It just didn’t wow me. The style in which it was cut is in line with what I remember, maybe. If we’re counting this exactly, we’re 1-1. I supposed the third time is the time charm. You’ll be the first to know when that is. I’m writing this as I watch the unofficial first day of coverage of the Winter Olympics, so please bare with me, I’m a bit excited. I wanted on the eve (or day of depending on where you are and when you read this) of National Pizza Day, for this story to be inspiring, remarkable, heartwarming, and all those other superlatives and blessings. When talking about Frank’s Pizza & Pasta in the Northeast Baltimore neighborhood of Hamilton, or is it Overlea? Well it’s Baltimore and it’s an institution that’s been around for over 30 years. That to me is worthy of a medal itself. I had actually intended on doing a story nearly two years ago but something told me the timing wasn’t right. If I’m recalling correctly, my pictures looked underwhelming, or maybe some universal force told me it wasn’t time. Some things can’t be explained nor need an explanation. My expectations had been raised after hearing about their pizza, from a couple peoples’ opinions that I respect immensely. And it’s all about your own opinion, your own beliefs, experience, and all that good stuff. But I can’t help but admit that I had high hopes. If we’re using Olympic terms, the technical scores may be a bit low, or the qualification times may be enough to make the next round but I don’t know. There are some deductions and maybe some penalties. There may need to be a redo. What does this all mean? I’ll get to the point. I wanted to love it but I can’t say that. I want to love every pizza and every experience, but it’s not always going be that way. While it’s easy to find positives (and there are), the faults do stand out. I got three slices, and how perfect was this selection. I might have stopped by right after the lunch rush since a lot of slices were bunched together, and the pickings were minimal. No problem at all, I still got a cheese slice, a meat lover’s, and the Mediterranean, which looked like it just came out of the oven. I’ll get my critiques out of the way first. The cheese, and meat lover’s looked much better displayed on trays beforehand than how they looked after they were heated. Maybe my eyes were deceiving me but the plain cheese looked like it shrank. You can also see that they reheated these slices a little too long. You can see the burnt parts, especially in the meat lover’s, that the crust actually fell apart where it was charred. Now there’s good charring and then there’s this. It wouldn’t have mattered though, as neither slice did much for me. The cheese felt flat and something just didn’t taste right. Maybe there wasn’t enough? Maybe it was out there too long. I don’t know. The meat lover’s is not one I would ordinary try anyways, but I figured why not. This one I could only take one or two bites of before I had enough. It was burnt and it was a little too hearty for me, but that’s more of a personal opinion as well. I like more of a…. And this brings me to the Mediterranean. This was the gem, or the crown jewel if you will, of the slices. Maybe the fact that it just came out hot and fresh had a lot to do with it. The toppings were exquisite and the pesto was tremendous. I think I got some magnificent olive oil too. All the toppings complemented each other perfectly. It’ll make me want come back. All this on top of a white pizza, is masterful. And I will. I think this place is capable of so much. It wouldn’t be around so long if it hadn’t, even with changing times and tastes. That’s the most in depth I’ve been about pizza in some time. I usually look for all the positives and situations related to everything outside of the food itself, as well. And I still did here. The staff is great, it’s very old school and very authentic in terms of service and appealing to a loyal clientele that serves a part of Baltimore you don’t always hear about, or think to go to. All I know is that it won’t be another few years until I’m back. If time allows, we shall do this again soon. I know I say that a lot, but we shall do this again soon. For more on Frank’s, here is their menu, and their storied history. Enjoy the Olympics, the opening ceremonies, and all the good that comes from that. I know I will. And Peace Be With You. 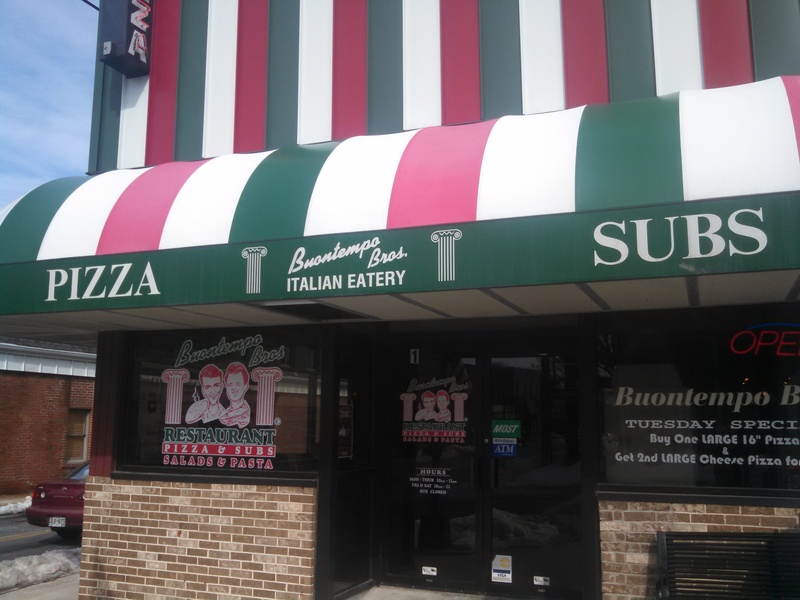 I have wanted to write about Buontempo Brothers Restaurant, since I began this blog. And I organically hoped to be in downtown Bel Air, MD to be able to try enjoy some unique slices. And this week I was fortunate enough to do so. Oh and you better believe, they have some creative ideas for pies. Just as important, they have a friendly staff that has always greeted me and as far as I’ve seen, all of their patrons with a friendly hello and some pleasantries. I have only lived in the area for over 6 years, but I always get the feeling, that there is a strong sense of community and it’s frequented by a lot of regulars, that have been coming for years. There’s a lot of love going around. It just feels like what a pizza place/Italian restaurant should be. And that love translates into their cooking. Simply put, I love their pizza. And you see how aggressive their menu is. 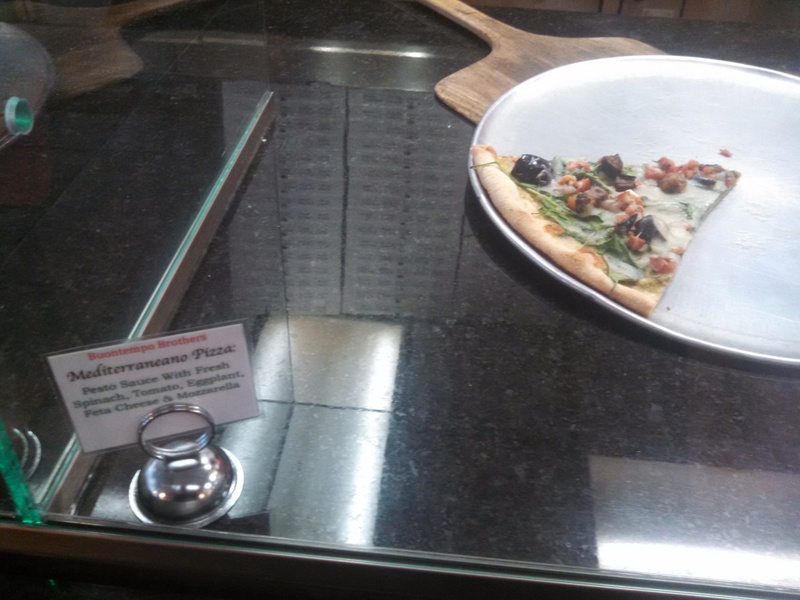 You see some selections that are atypical of many pizza parlors. And ever since, the first time, I visited them in 2008, it’s been nothing short of fantastic quality. My indoctrination came from their Tuesday special. A purchase of any large pizza, would get me a second large cheese for just $2.00. Worth it’s weight in gold, and za! My favorite slice of theirs, is the Chicken Pesto, and I’ve continuously raved many times on how much I love pesto. I will review this slice in time, but I wanted to get out of my comfort zone again. First off, I ordered the Mediterranean and as you can see below, I barely made it to the party. I will say, that their crust has always stood out to me. I can’t put my finger on it. I don’t know if it’s something in the water but, oh my goodness, it’s divine. I sense there might be some parmesan or butter embedded in the crust, or I could be tricking my into thinking as such, But it’s top notch. I could’t resist the pesto anyways, as we’re drawn to each other like magnets. But this is a damn fine slice. 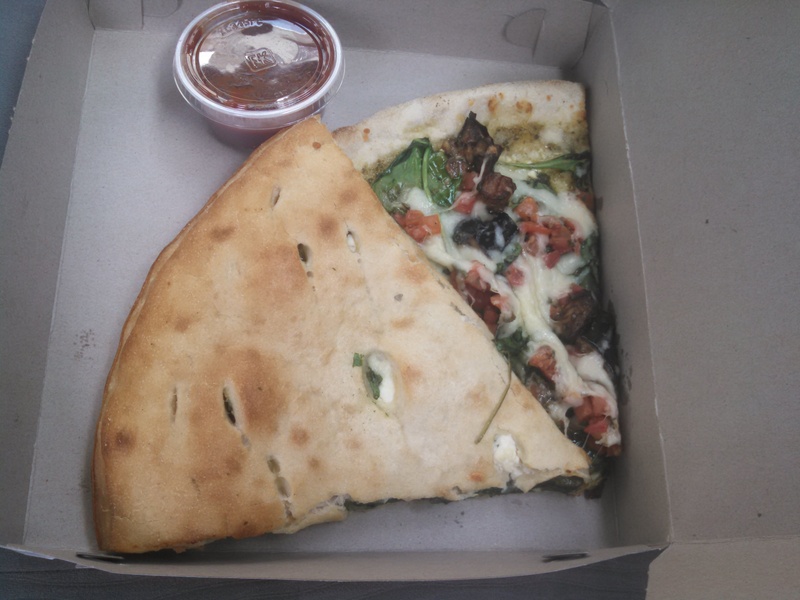 With the aforementioned pesto, eggplant, feta, tomato, and spinach piled on top of a traditional cheese slice, this is a certified winner. I was so happy to try this and will be seeking it out again. I know, many of us, myself included, can’t help but devour a pizza very quickly. In this instance, I tried to savor this. The flavors and the soul behind this slice, coming together, was pure ecstasy. My second order, the Stuffed Spinach, almost didn’t have a chance. I’m glad I got it though, and for folks that love bread, this is amazing. But it’s too filling for me. But that doesn’t mean I wouldn’t try another stuffed pie again. It’s all a matter of taste. I was pretty full after the first choice. 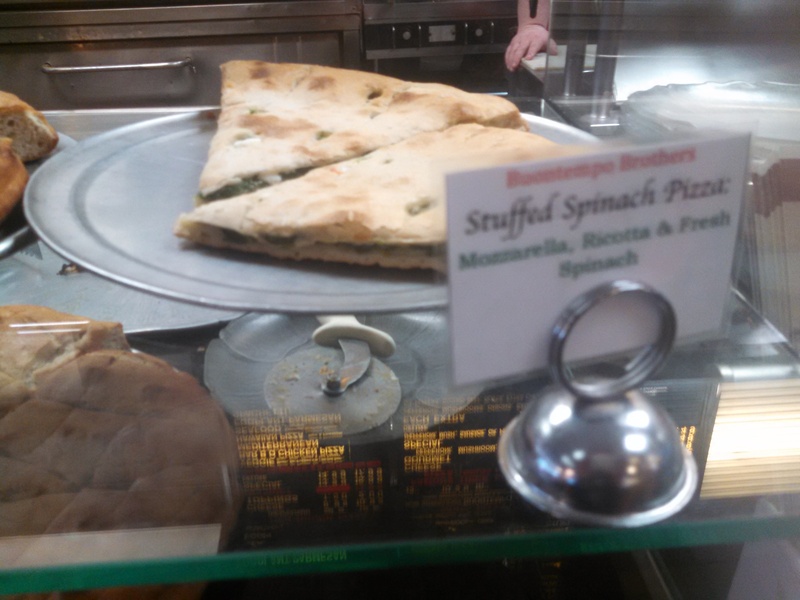 I could hardly eat the crust but, the spinach, ricotta, and mozzarella inside was a real winner. Toasted to perfection. On a thin crust, it’d be even more magical. The marinara sauce, on the side, added some more flavor, that was already bringing some good ones. Still a solid slice, just not something I would go for, on a regular basis. I had to break the two pies apart, and perhaps that’s a source of good luck or just great food. If you’re in the Bel Air vicinity, I suggest going here. There’s a vibrant energy that keeps many of us coming back. One review of this place will not do it justice. More to come.